"I had to take two busses to get to work," says Flavia, 38, who came to the US from Mexico 17 years ago. "I left my house in Redwood City at 6:00 in the morning and arrived at work at 7:50." Another more devastating result of Flavia's working in Santa Clara was that she was forced to drop one of her ESL classes since her long commute gave her little time to study. That all changed when Flavia purchased a car courtesy of a money grant from Philanthropic Ventures, a Bay Area foundation, that provides selected Upwards Scholars students with a car "scholarship" if they can demonstrate that owning a car will free up commute time so they can take more classes and therefore complete their studies more quickly. 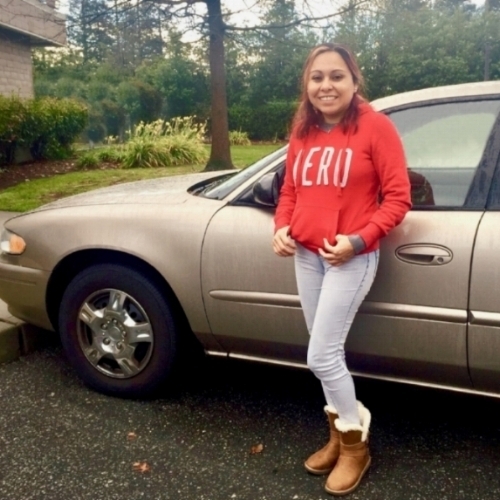 In Flavia's case, owning a car not only reduced her commute to 30 minutes each way but also gave her back the time to take two ESL classes instead of one. "My goal is to be the store manager, but to do that, I need more English," Flavia says. "Now that I have a car, I can spend more time studying”.